I opted to make my own breadcrumbs for the Nut and Spinach Loaf out of my whole-grain sprouted bread because of our cookbook author's opinions about white bread and flour. Let's just say that he was not a fan! I wasn't able to find pre-made whole wheat bread crumbs, so that's why I went with DIY. Conveniently, Bernarr MacFadden also included a recipe for Bread Crumbs in the Physical Culture Cookbook. If this extra prep work doesn’t appeal to you, feel free to skip this step and use purchased breadcrumbs in your Nut & Spinach Loaf. Cut stale bread into slices. Put into oven not hot enough to toast but merely to thoroughly dry them. When brittle, remove and pound fine, or put through a coarsely-set hand-mill. Crackers can be crumbled fine enough with the hands, but in the case of bread grinding is easier. A good guideline for making your own breadcrumbs is that you'll end up with ¼ - ⅓ cup of breadcrumbs per slice of bread. Since we'll need a bit more than 1 cup for this recipe, make sure that you use at least 5 slices. Since my bread slices were on the small side, I used 7 slices and had a bit left over. Put your bread on a cookie sheet and place in the oven. I started with 175F (80C) for 15 minutes without much effect, so I increased my temperature to 275F (135C) and they were dried out after an additional 20 minutes. Do yourself a favour and set your oven to 275F the entire time! Cut the bread into smaller pieces and pulverize into crumbs in a blender. Nut and Spinach Loaf is found in the "High-Protein Non-Meat Dishes" chapter of the Physical Culture Cook Book. This vegetarian loaf holds together well when its being formed, but doesn't slice well. Nevertheless, it is tasty and satisfying and I'd make it again! This loaf is on the small side, so if you’re preparing a meal for more than a few people, I’d make a double recipe. Cook the spinach in the double boiler with very little water, and chop fine. Add the nuts, onion and seasoning, the beaten egg, and lastly the bread-crumbs. Mix well and let stand for a few minutes. Make into a loaf and roll in bread-crumbs. Brush with melted butter, and bake twenty-five to thirty minutes. Serve with a savoury sauce. 1) Chop the spinach, then put in a large pot with a small amount of water (I put 2 cups of water in with the 10 cups of spinach). Steam until wilted, then drain. Thoroughly remove the water by pressing the spinach against a mesh sieve with a spatula. 2) Chop the onion and chop the walnuts into small pieces in a blender. Stir the spinach, nuts, onion, salt, pepper, egg and bread crumbs in a bowl until well combined. Put the bowl in the fridge for a while to allow the mixture to set. 3) Preheat the oven to 325F-350F (165C-175C). Melt butter and gather more bread crumbs. Remove the bowl from the fridge once cooled, then use your hands to form it into a loaf shape. Gently roll the loaf in the breadcrumbs, then brush the outside of the loaf with the melted butter. This loaf was baked after 35 minutes at 325F, but turn the temperature up to 350F and it'll be done sooner. Since the Nut and Spinach Loaf Recipe suggests that you serve it with a "savoury sauce", I chose this Tomato Sauce recipe because I was intrigued by the cloves and wondered what it would taste like. The answer is that it tastes a tiny bit like a very thick ketchup! With the suggested measurements, this sauce has the consistency of a paste so if you'd like a runnier sauce, I suggest either cutting the butter & flour or adding more crushed tomatoes. I used crushed tomatoes, so I didn't need to carry out the step of straining out the seeds mentioned in the historic recipe. This meant, unfortunately, that I needed to look through the sauce and remove all twelve whole cloves by hand, which was a pain. If you don't want to do this step, why not skip the whole cloves and add a shake or two of ground cloves when you add the salt and pepper? Cook the tomato, onion and cloves ten minutes. Heat the butter in a small frying-pan, and add the flour. Stir over the fire until smooth and brown; then add the tomatoes. Cook two or three minutes. Season, then run through a strainer fine enough to keep back the seeds. 1) In a small pot, add the tomato, onion and whole cloves and simmer for about 10 minutes. If you're not using whole cloves, just add the tomato and onion for now and add ground cloves later on when you add salt and pepper at the end of the recipe. 2) Remove the whole cloves from the tomatoes. In another pot or pan over medium-low heat, melt the butter and stir in the flour. Stir this mixture until it bubbles, then slowly add the tomato and onions, stirring well, until it is all combined. Add salt, pepper and ground cloves to taste. 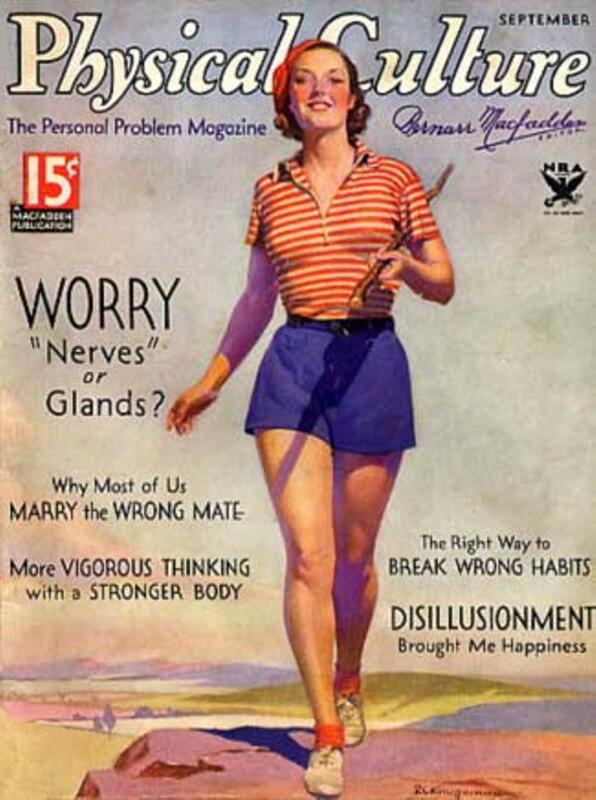 Physical Culture was a health, wellness and physical fitness magazine that was published from 1899-1955. Its editor and publisher, Bernarr MacFadden was a charismatic and passionate man who was not afraid of sharing his wellness ideology. I like to think that the story of his name change sums up his personality well: he changed his name from Bernard McFadden when he was 26 years old because he thought that MacFadden sounded stronger than plan ol' McFadden. He altered his first name to Bernarr because he thought it sounded like a lion's roar: BERNARR! In his preface to the Physical Culture Cook Book, MacFadden writes that "We advocated natural foods in contrast to the artificial foods, obviously made to please the eye and palate, and with no comprehension of their actual nutritional worth. We believed that science could and should find out what was the correct diet for man and what foods would best support life and health. In the absence of positive scientific knowledge, we taught that natural foods and natural flavours were more to be trusted than artificial products and artificial flavours created without any knowledge as to their actual worth to the human body." In the Physical Culture Cook Book, there are chapters outlining the Nut and Fruit Diet, the Raw Diet, the Vegetarian Diet and The Mixed Diet (eating meat in moderation). Other chapters have a look at eating only when you are hungry, the benefits of fully chewing your food, whether or not you should drink water with meals and how to detect adulteration in foods like milk, olive oil and coffee. I don't think anyone could truthfully say the Bernarr MacFadden's life was boring. He advocated loudly for fasting, eating less meat and physical exercise for both men and women and opposed alcohol, tobacco, processed foods, white bread, pharmaceutical medications, vaccinations, corsets, high heels and shoes in general. He opened health spas, restaurants, hotels and ran a large publishing empire. He once declared his candidacy as the President of the United States. When he turned 81, he began an annual tradition of parachuting from an airplane into a river each year on his birthday.